A 55-year-old female with history of HIV and Hepatitis C presents for annual screening mammogram where a 2 cm area of architectural distortion is identified in the right lower outer breast seen only on the DBT images. Additional mammographic diagnostic imaging confirmed the area of architectural distortion. On US, the patient had no sonographic correlate for the DBT finding. Thus, the patient had a stereotactic biopsy of the architectural distortion with pathology consistent with radial scar. The right breast CC 2D digital mammogram (Figure 1) was read as benign. 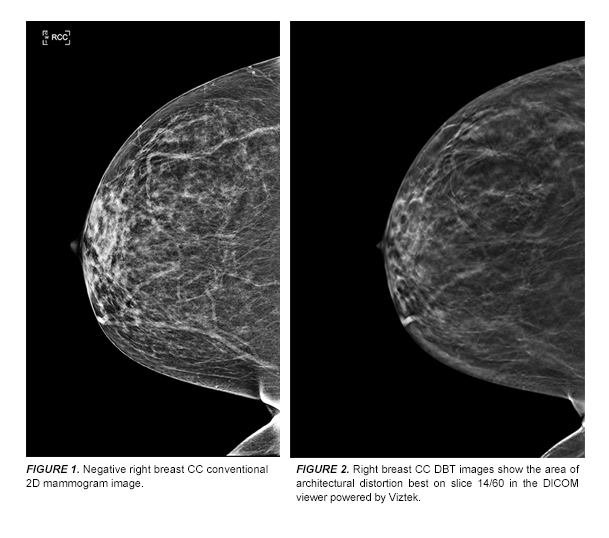 Selected right breast CC images from DBT show that the area of architectural distortion is in the right outer breast middle depth (best seen on Right CC slice 14/60). Kopans DB.Breast Imaging, 3rd edition. Lippincott, Williams, and Wilkens, 2006. Sloane JP, Mayers MM. Carcinoma and atypical hyperplasia in radial scars and complex scloerosing lesions: importance of lesion size and patient age.Histopathology. 1993; Sep;23(2):225-31. Jacobs TW, Byrne C, Colditz G, et al.Radial scars in benign breast-biopsy specimens and the risk of breast cancer. N Engl J Med. 1999;Feb11;340(6):430-6. Schnitt, SJ & Collins LC. Biopsy Interpretation of the Breast. Lippincott, Williams, and Wilkens, 2008. Zuley ML, Bandos AI, Ganott MA, et al.Digital Breast Tomosynthesis versus Supplemental Diagnostic Mammographic Views for Evaluation of Noncalcified Breast Lesions. Radiology. 2013;266(1):89–95. Skaane P, Bandos AI, Gullien R, et al. Comparison of Digital Mammography Alone and Digital Mammography Plus Tomosynthesis in a Population-based Screening Program.Radiology. 2013;267:1:47-56. Radial scar associated with calcium oxalate crystals. Appl Radiol.